I left you as we departed last week’s wedding in Queens for Manhattan with the younger party goers still in full swing. But the following morning the energy was more subdued with some very sore heads. And the solution? (indeed what is the solution to most things these days?) 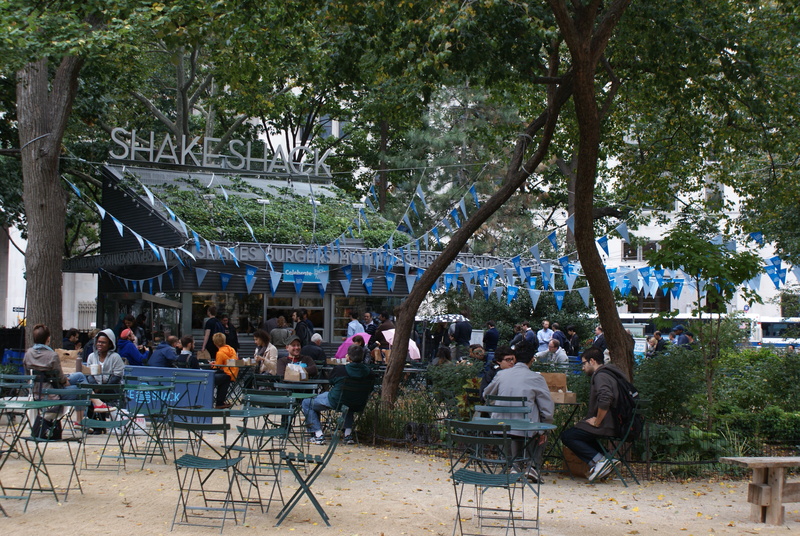 well Shake Shack of course. This burger phenomenon has spread over the pond now and was one of the most popular stands at Taste of London this year, believe it or not, and back in New York the queues are still endless. We met at the original Madison Square Park site under the trees – a cool outdoor space and 94 burgers later, the friends and family were back on their A game, repleted and waving goodbye to Mr and Mrs K as they departed for their Italian honeymoon. Another clever food ploy from these two and a perfect finale to a wonderful three days. Mum, Dad, sis and I met that evening for our own get together at Kings County Imperial – a superb Chinese in Williamsburg with their very own soy sauce and their own garden out the back to supplement their organic seasonal produce. It was one of the best Chinese meals I have ever had and was rounded off by us mopping up the remaining cronuts. 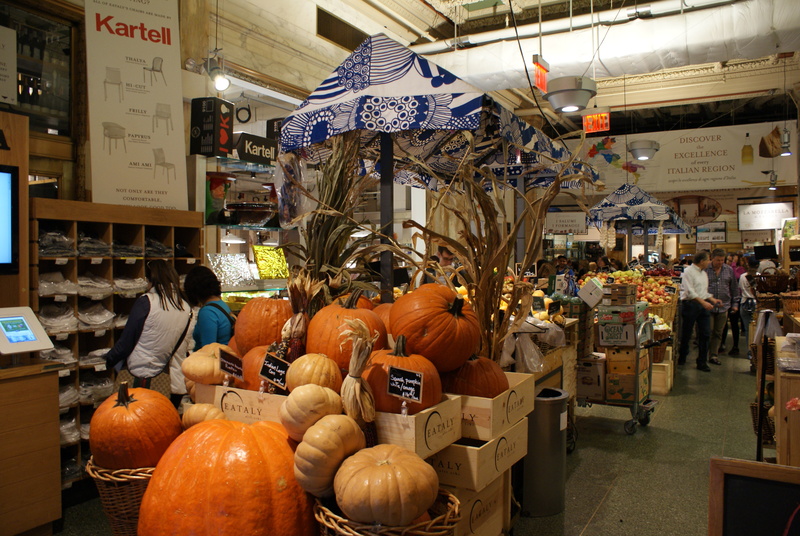 I still had a couple of days to explore and having read this Eater article, decided to review the food halls of NYC. The article points to the fashion in Europe for what they call food halls and cite Eataly in NYC as the first of this growing US fashion. Eataly is indeed a place to be visited and the combination of Joe Bastianich and Mario Batali is a marriage in food heaven. The benefit of this is that there is a single overarching style and standard which this duo imposed on the concept moving it on from the originals in Italy. The article also says the new halls are a far cry from the suburban shopping mall food courts but I beg to differ. I visited all on the Eater New York list and found them to be disappointing experiences. My first foray was to City Kitchen which claims to be a food market with funky signage leading upstairs. There you find good views over 8th Avenue and the queues at Shake Shack opposite but no food market. Rather a strange mix of places with poor seating in the section itself and an overflow going into the adjacent Row hotel which was at least a little more interesting. I really struggled to find anything worth eating and when I decided just to get a drink I was confronted with a New Yorker with attitude that made me feel like I had done something horribly wrong. I am sure that the brands that are there all link back to some great places back in their mother sites but honestly it didn’t connect for me. 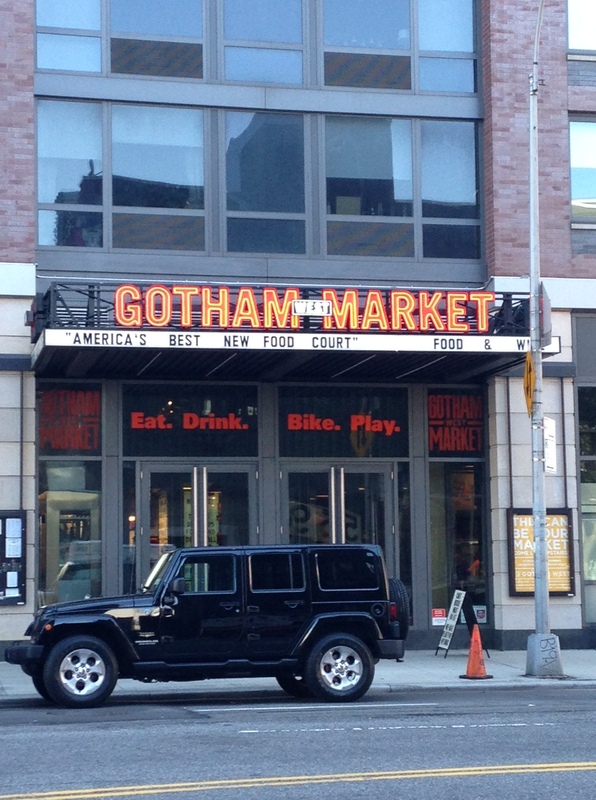 Unperturbed, I progressed to the next on my list which was Gotham West Market and a showcase in how to do the industrial look with quirky comms. I know my timing was a little unfortunate, but again this was too much style over substance for me. 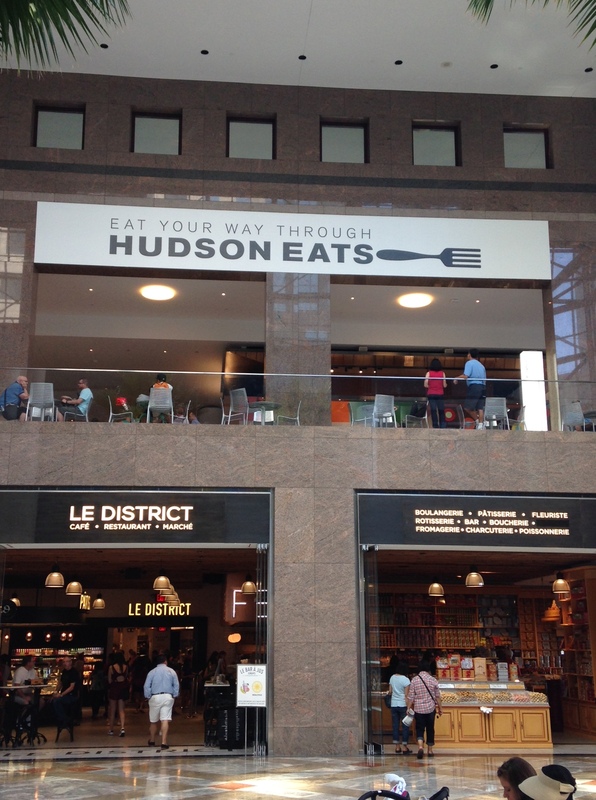 I left almost immediately and progressed down towards the World Trade Centre and the shopping centre opposite: home to Le District and Hudson Eats. 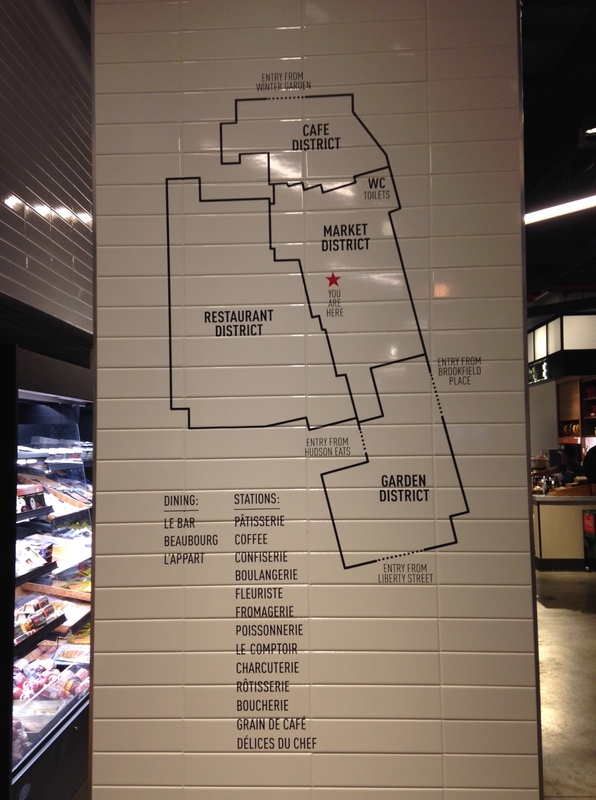 To be fair, Le District was a well designed homage to French cuisine and when you are such a long way away from Europe I am sure that it ticks a lot of boxes. The zones inside worked much in the same way as Eataly in Turin and the overall atmosphere was much more enticing and the product range at least made sense in terms of the concept. A bit further upstairs in the upmarket and yet unfinished Brookfield Place shopping centre is a better but similar version of City Kitchen: a mix of trendy brands each with their own cubicle to serve an edited menu of their dishes. The trouble for me was that it wasn’t as grunge or as a pop up or as slick as the actual restaurant itself, instead a strange combination of the worst of each place. Yes there were bagels and salad bars, ribs and Mexican but sitting together with formulaic seating and lots of trays carrying food that was rapidly going cold, I really couldn’t be inspired to eat anything at all. The best option would be to take away a Sprinkles cupcake which reminded me of a great experience many years ago in LA but I just wasn’t in the mood. 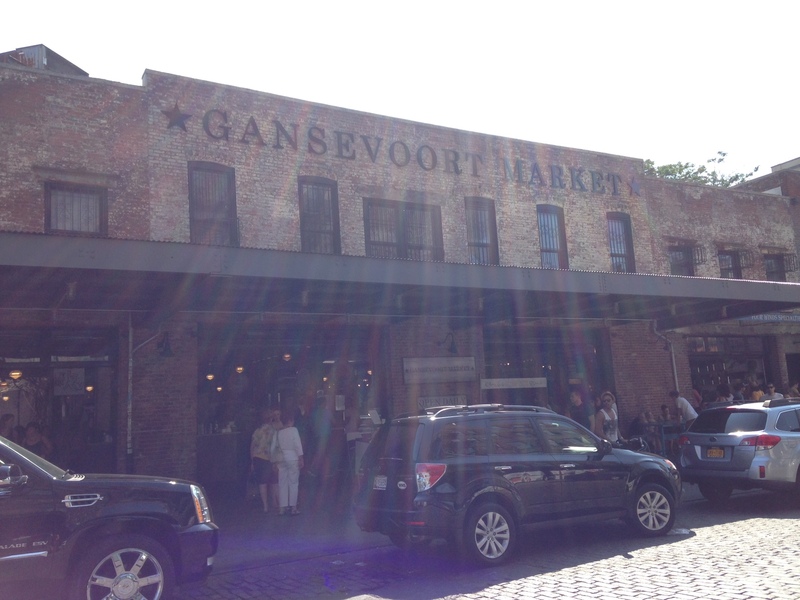 The final place to try was Gansevoort Market in the Meatpacking district and warily I made my way down there making sure that I went via the Highline and Chelsea Market just in case I was disappointed. These two places are always worth seeing in my eyes when you are in NYC and whilst they were crazy busy they still retained many of the aspects that I enjoy. And so to my final market foray. Ganservoort was my favourite of them all. 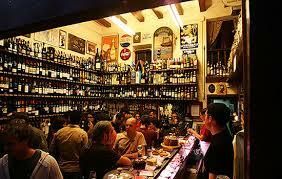 It simply had more atmosphere and a more foodie slant, relating back to the history of the market back in the 1880’s. 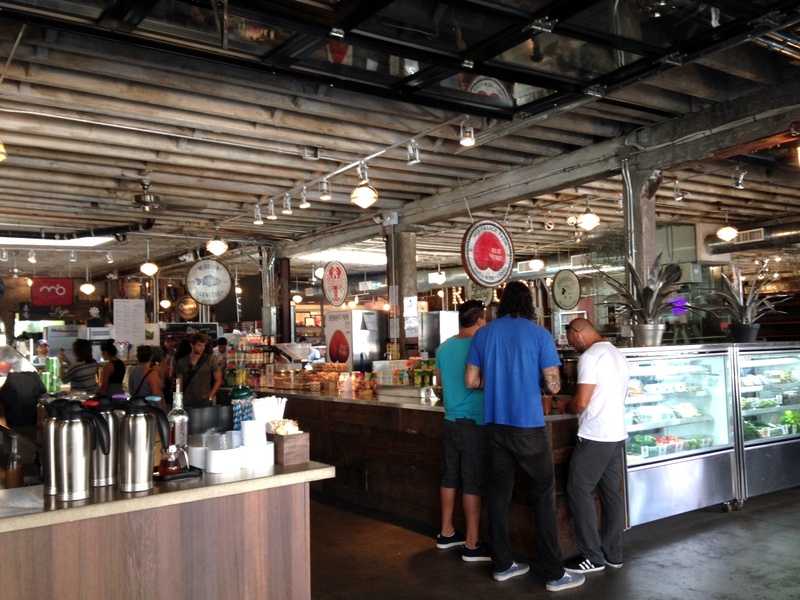 It reminded me of the Saturday Biscuit Mill market in Cape Town. The products were well prepared, the authenticity was more easily communicated within each stand and the seating was more familiar with clusters sitting throughout the area rather than one big central communal melamine topped section. It also falls out onto the Meatpacking district with outdoor seating and more going on which gives a vibrancy that the other shopping centre floors lack. All in all I have to conclude that the food markets or food halls or whatever the latest marketing says are merely more like the original shopping mall eateries and if you want to create a new community of young vibrant food brands you have to do a bit more than put them in a giant circle around a central seating area. What Eataly has is a connection to how the food is made, the ingredients it comes from and the vibrancy that sitting together and sharing a meal can deliver. As a food hall it allows you to eat in and take home, it gives you more choice and a wide range of all things relating to Italian food. It gives you a story with a message that allows you to connect and therefore feel grounded in its wake. 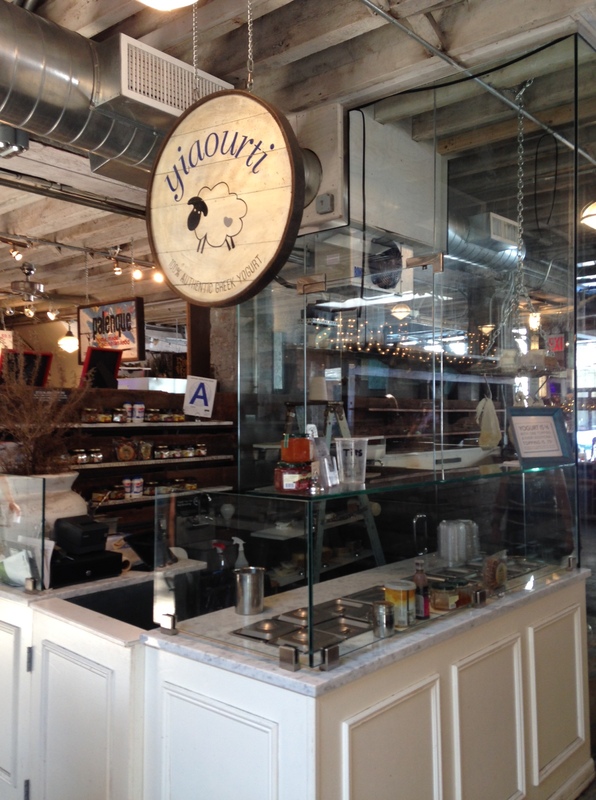 Nothing new that has cropped up since I first saw Eataly in NYC has come near to matching what it offers. I await with bated breath to see what Antony Bourdain does with his new concept because I know he understands the levers that make great food experiences and combining that with his passion for street food will undoubtedly add up to something more real and tasty than any of these new breeds. I look forward to that. 2. Annie the Owl Bar – apparently we really do want to share our evening cocktails with a pack of owls. There is nothing more that I can say about this one. It will be a hoot !!! You can enter the ballot for a seat if you really want to here. But be warned. Apparently 44454 have already entered at the point that I type. No comment. 4. 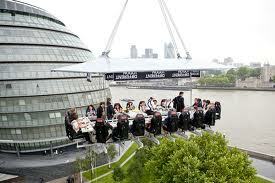 It seems that the Dinner in the Sky group had such great success with their 2014 pop up that they plan to repeat it some time this year and if you too want to eat your latest meal suspended 100 feet up in the air then you too can register your interest here. Frankly, it would be enough for me to stop throwing my meal up at that height so it is definitely a waste of these highly regarded chefs’ talents, so I won’t be one. Thankfully I missed the Cuddle Cafe pop up, sponsored by McVities, just before Valentines Day which offered tea and cake in exchange for cuddles. And it appears that the Death Row Dinners concept worked only in the minds of the creators, although I am sure we have all had that conversation about what we would eat for our last meal. They had to apologise profusely after a barrage of offended people pointed out that this may not be such a good idea and somewhat offensive to those actually on death row. And yet, pop ups will continue to be a great way to try out a new idea on the unsuspecting and ever up for it London public. 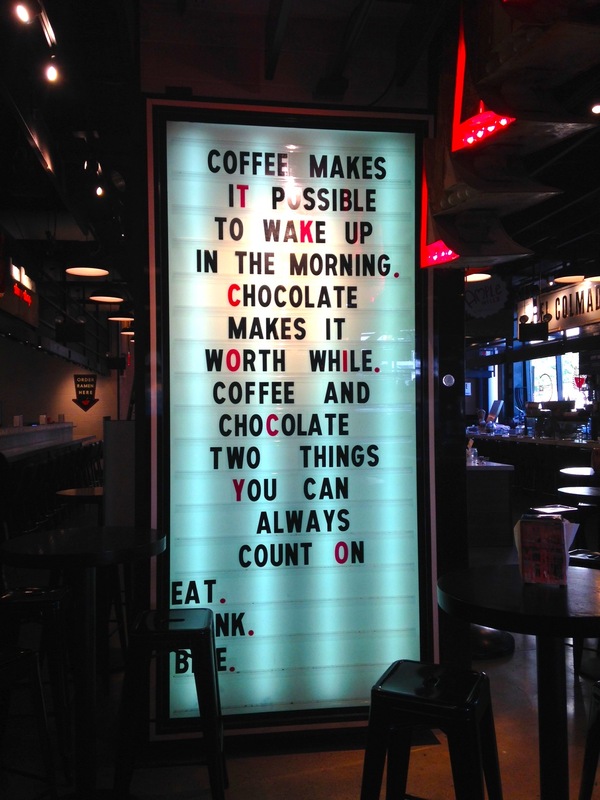 Just make sure it is either in Soho or the East End of London, it has some quirky name and that your social media platform is set up and ready to rock.